Need any server administration task done on your servers? You can use our monthly plan ( 10 hours for $ 125 ) or our per hour plan ($ 15/hour).Setup fee $ 20 will be excluding. PHP configuration, update and installations with options like GD, Curl etc. Server Management plan as the name suggests, manages your server. Here we will monitor your server 24×7, as to which all services are running in the server and also take are of third party software installations. With this plan you can ensure that the server maintains the uptime guarantee. Per ticket plan suits for those who has just started a hosting company and for those who wants to meet guaranteed response time. Here all the tickets will be answered with in the time limits guaranteed. This plan also suits for those who have low budgets. Shared techs handling minimum two to max 10 projects at a time. 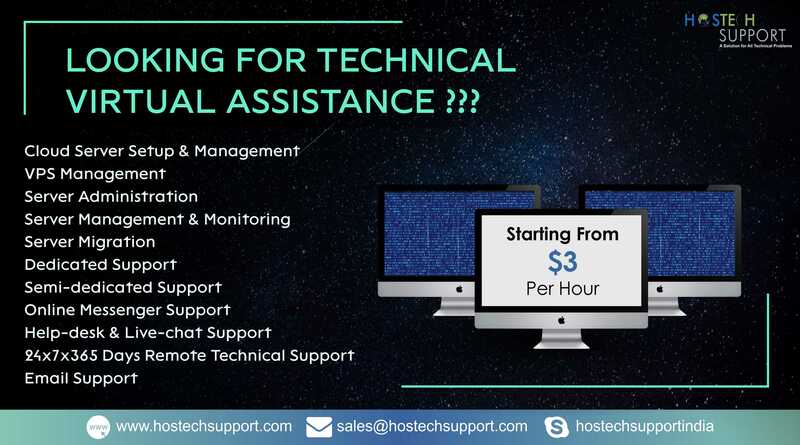 Start your new Hosting Business with the Solid support of Hostechsupport entire 24/7/365 Team behind you. At an unbelievable $ 100 for 1 server. This is the startup price and is now introduced as a special Offer for startup companies. Semi Dedicated Plan was specially introduced for the Providers who have medium size business where they need to offer their client a qulaity support but within the price they can afford. Team of 4 Shared Techs, working round the clock in 3 shifts i.e one in each individual shift and fourth tech as a backup tech covering sick leaves and weekly offs for other three techs. Dedicated support gives you a complete solution for technical support. Here we will take care of your entire clients and you can concentrate on increasing the business. We will sort out all the issues of your clients; take care of your servers.